1950s newspaper asks: "If a woman needs it, should she be spanked?" Open any newspaper today and you&apos;ll find reader polls touching on everything from climate change to fashion trends. 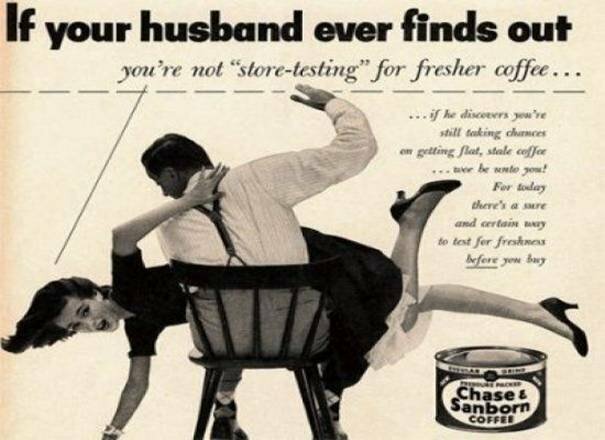 Yet one topic that would never be up for discussion is when it&apos;s okay for husbands to spank their wives. This wasn&apos;t necessarily the case back in the day. The image above, believed to be a clipping from the New York Daily Mirror tabloid circa 1950s*, has been doing the rounds on Twitter this month after being shared by History in Pictures. The article depicts four Brooklyn men - a counterman, a barber, a parking lot attendant and a toy factory owner - weighing in on a question submitted by a reader, Herman Martin. The issue in question is discipline in the home - more specifically, whether a woman should be spanked if she "needs it". You know, just regular dinnertime conversation fodder. As if the question itself isn&apos;t disturbing enough, all four men emphatically justify the right of husbands to strike their wives. Miguel Matos reasons, "If they don&apos;t know how to behave by the time they&apos;re adults, they should be treated like children and spanked," while Teddy Gallei believes spanking teaches a lesson in respect to women who have forgotten that "this is a man&apos;s world". 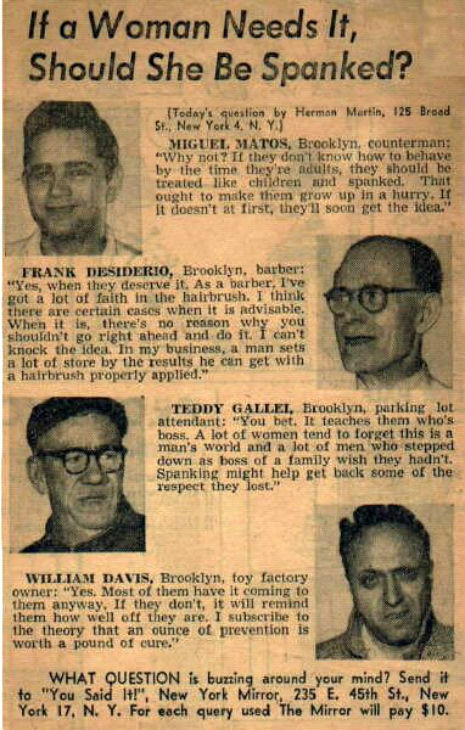 William Davis prescribes that "most of them have it coming to then anyway" and barber Frank Desiderio admits to having "a lot of faith in the hairbrush" - presumably as a weapon. Here&apos;s a final shocker - if the article footer is to be believed, Herman Martin received $10 for submitting his question to the "You Said It" section. *There has been speculation over the authenticity of the clipping, with many suggesting it is in fact a well-executed hoax. If you know anything more, we&apos;d love to hear from you.